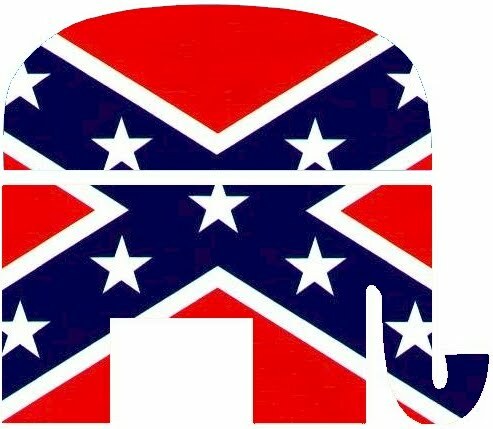 I constantly see reference to the Dixiecrats on conservative blogs, claiming that Democrats are the racists, not the teabag fringe of the right. Based on these comments, I thought it would be interesting to take a look at the Dixiecrat party platform, which was adopted in Oklahoma City 62 years ago and see how it relates to the new Republican party. 1. We believe that the Constitution of the United States is the greatest charter of human liberty ever conceived by the mind of man. 2. We oppose all efforts to invade or destroy the rights guaranteed by it to every citizen of this republic. 3. We stand for social and economic justice, which, we believe can be guaranteed to all citizens only by a strict adherence to our Constitution and the avoidance of any invasion or destruction of the constitutional rights of the states and individuals. We oppose the totallitaran, centralized bureaucratic government and the police nation called for by the platforms adopted by the Democratic and Republican Conventions. Pretty standard language for any teabag rally and GOP event. 4. We stand for the segregation of the races and the racial integrity of each race; the constitutional right to choose one's associates; to accept private employment without governmental interference, and to learn one's living in any lawful way. We oppose the elimination of segregation, the repeal of miscegenation statutes, the control of private employment by Federal bureaucrats called for by the misnamed civil rights program. We favor home-rule, local self-government and a minimum interference with individual rights. This also seems to fall in line with modern "conservative" thinking - while you may have those from the right-wing claim they are not racist, that is far from the truth. Just consider any post made on Andrew Breitbart's Big sites, in which there is a constant bombardment against Muslims, homosexuals, and black administration officials (think Shirley Sherrod) - the right is constantly juxtaposing cultural differences in an attempt to rile their base. 5. We oppose and condemn the action of the Democratic Convention in sponsoring a civil rights program calling for the elimination of segregation, social equality by Federal fiat, regulations of private employment practices, voting, and local law enforcement. 6. We affirm that the effective enforcement of such a program would be utterly destructive of the social, economic and political life of the Southern people, and of other localities in which there may be differences in race, creed or national origin in appreciable numbers. Consider Rand Paul's recent comments regarding the Civil Rights Act or Glenn Beck's constant ranting about "social justice." Consider the article by Big Government blogger Andrew Mellon that railed against multiculturalism. 7. We stand for the check and balances provided by the three departments of our government. We oppose the usurpation of legislative functions by the executive and judicial departments. We unreservedly condemn the effort to establish in the United States a police nation that would destroy the last vestige of liberty enjoyed by a citizen. Think of all the attacks made against the President Obama's czars in how they are circumventing the legislative branch of government or how every judge that rules against a conservative notion is some sort of activist, exercising legislative control from the bench. 8. We demand that there be returned to the people to whom of right they belong, those powers needed for the preservation of human rights and the discharge of our responsibility as democrats for human welfare. We oppose a denial of those by political parties, a barter or sale of those rights by a political convention, as well as any invasion or violation of those rights by the Federal Government. We call upon all Democrats and upon all other loyal Americans who are opposed to totalitarianism at home and abroad to unite with us in ignominiously defeating Harry S. Truman, Thomas E. Dewey and every other candidate for public office who would establish a Police Nation in the United States of America. Sounds like the 2010 midterm election rally call for the GOP. 9. We, therefore, urge that this Convention endorse the candidacies of J. Strom Thurmond and Fielding H. Wright for the President and Vice-president, respectively, of the United States of America. Glad to be of service. The similarities are amazing. I actually found this platform on a website called Veteran of The War Against Liberals. John Smithson A "Flip Flop Fundamentalist?" Why Is Terry Jones Still Around? I'm A U.S. Constitutional Watchdog! Sarah Palin Makes The Dictionary! Elections Out Of Touch With America? Glenn Beck "Supporter" Of "Ground Zero Mosque?" John Smithson Fails To Understand Anything!